CiloGear WorkSacks have won three Alpinist Mountain Standard Awards. The last review called the V3 60L WorkSack "Perfection". The entire line of WorkSacks -- from 20L to 75L -- won the Guides' Choice Award. They wrote that the WorkSacks are "an excellent choice for both the weekend warrior looking for a quality pack and the serious alpinist doing routes of extreme difficulty." SplitterChoss called the 45 "the nicest carrying pack I’ve ever used." On the other hand, WildSnow calls the WorkSacks ...simple, light backpacks that are well designed and last forever." The no longer available woven Dyneema 45L WorkSack took 4 stars from Alpinist Magazine as a winter mountaineering pack, despite the small size, and the review closed with "For a summer alpine climbing pack, the CiloGear pack will be seen on my back for the bulk of my overnight trips." Gear30 writes: This pack is the best climbing pack I have ever seen! I have used probably 15-20 different packs over the years for climbing, including Black Diamond, Arc'teryx, Wild Things, Osprey, Granite Gear, Dana Design, and others, and I have never used a pack that carries so comfortably with heavy loads that can also strip down so light and simple for climbing and as a summit pack. 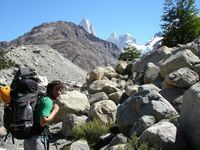 There are some packs that are as simple and climb as well, and there are packs that carry loads as well, but there are no other packs that I know of that does everything as well, and for an affordable price. Reviews from magazines and from customers and even some CiloGear Nationalists. It's not like we could ever pay them...Here's one from the late, dearly missed Joe Puryear. Click here for the latest Rockclimbing.com Review. It's the report from an 8 month field test by RockClimbing.Com's editorial staff. Or click here for reviewson trailspace including what one calls The best winter pack ever. Here's a review on summitpostgear.com of our 45L WorkSack.